I’ve been baking up a holiday storm full of gluten-free, dairy-free, corn-free, (and a few VEGAN) holiday treats. Two of the cookie recipes turned out yummy enough to share here (the rest, including my favorite Spritz Cookies, are still “under development”). 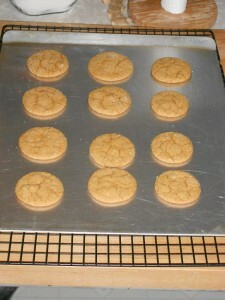 The Joyous Ginger Snaps crackle and crunch, just like they should. 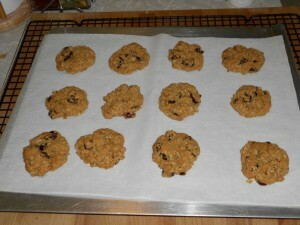 The Oatmeal-Craisin Cookies (GF & Vegan) are wholesome and festive. Cream together shortening, sugar, and 2 teaspoons water. Stir in egg, molasses, and vinegar. In a separate bowl, whisk together flours, gum, soda, salt, and dry spices. Gradually add to shortening mixture. Mix until blended. 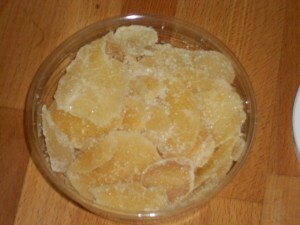 Add candied ginger pieces. Mix until blended. Form dough into 1/2-inch to 3/4-inch balls. Roll each ball in granulated sugar and place on greased cookie sheet. Bake 14-16 minutes in a 325° oven. Cool on racks. Combine flax seed and water in a small bowl. Stir. Let sit 10 minutes, stirring occasionally. In a medium bowl, whisk together flour, gum, soda, powder, salt, and spices. In a large bowl, cream shortening and sugars. Add flax mix, vanilla, and water. Beat well. Stir in oats and craisins (I do this with a wooden spoon rather than the mixer). On greased (or parchment covered) cookie sheet, place 1 Tablespoon balls of dough spaced 2-3″ apart. Bake for 18 minutes. Cool on sheet, then move to rack. This entry was posted in Cookies, Recipes and tagged cookies, craisins, cranberries, dairy-free, ginger, gluten-free, oatmeal, vegan by HSG. Bookmark the permalink.